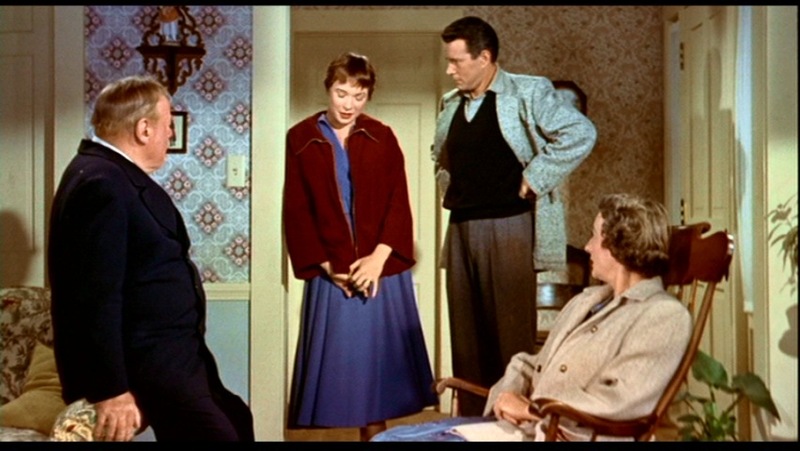 Principal cast: John Forsythe (Sam Marlowe), Shirley MacLaine (Jennifer Rogers), Edmund Gwenn (Captain Albert Wiles), Mildred Natwick (Miss Ivy Gravely), Mildred Dunnock (Mrs. Wiggs), Jerry Mathers (Arnie Rogers), Royal Dano (Deputy Sheriff Calvin Wiggs). When Alfred Hitchcock first proposed The Trouble With Harry to Paramount studio execs in 1955, they were not very keen on the project. 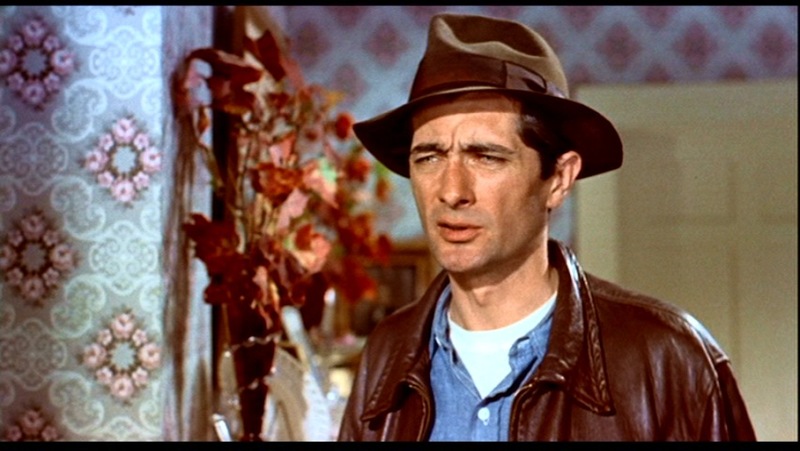 But they were not really in a position to quibble; in his short tenure at the studio Hitchcock had delivered a monster hit in Rear Window, and his follow-up To Catch a Thief had all the makings of a hit as well. So they indulged him in his desire to make a small budget character piece, a comedy no less. The movie involves the inhabitants of a small New England village, and their interactions with the corpse of a man named Harry. 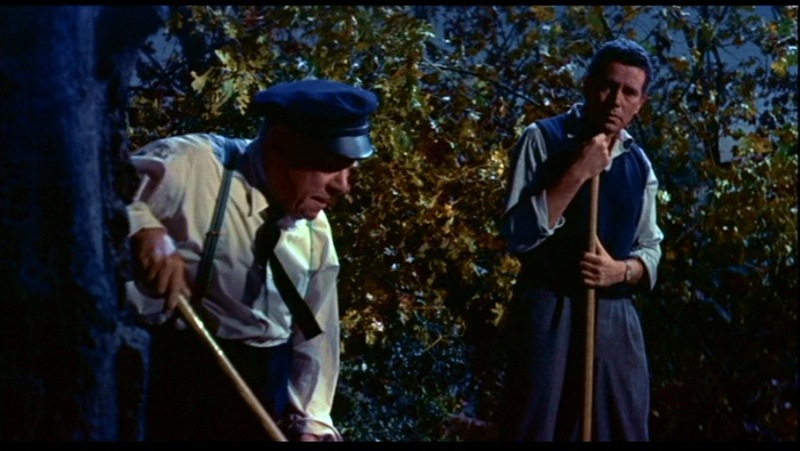 Captain Wiles (Edmund Gwenn) believes he accidentally shot the man, and enlists the help of local talented painter Sam Marlowe (John Forsythe) to bury the body. Captain Wiles later determines that he couldn’t have shot Harry, and the body is dug up. Local spinster Miss Gravely (Mildred Natwick) admits to hitting Harry on the head with her shoe, and Harry is buried again. 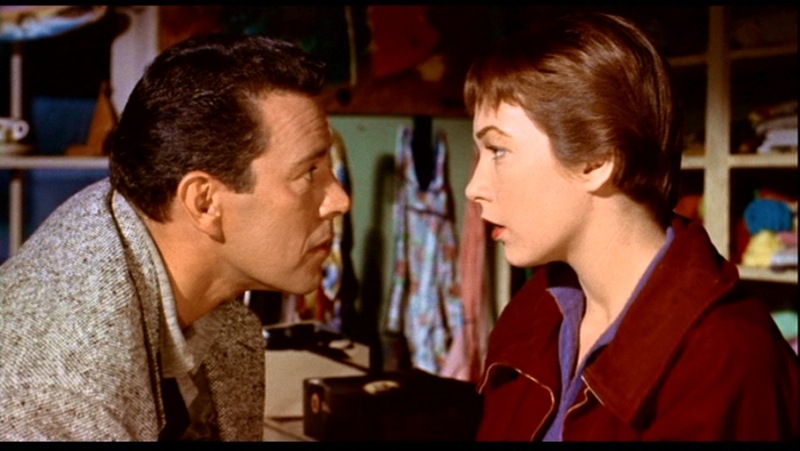 We later learn that Harry was the estranged husband of single-mother Jennifer Rogers (Shirley MacLaine) who has no love lost for Harry. Over the course of the film, the body is interred and disinterred about three times, practically right under the nose of the local dimwitted Deputy Sheriff, and finally the four friends decide what to do with Harry. This film is in no way a murder mystery. It is very simply a character study with darkly comedic tones. One could almost call it a sweet film. Interestingly, the film takes place entirely in one 24-hour period. Innuendo: Screenwriter John Michael Hayes was as much a fan of sexual innuendo as Hitchcock. There had been hints of innuendo in Hayes first screenplay for Hitch, Rear Window. He added even more to his next screenplay, To Catch A Thief, and became even bolder still in this screenplay. When Captain Wiles confesses to Sam that he has a date with Miss Gravely, Sam replies “Do you realize you will be the first man to…cross her threshold?” The Captain replies “She’s a well-preserved woman, and preserves have to be opened someday.” The first time Sam kisses Jennifer she tell him “Careful, Sam, I have short fuse.” This kind of banter pops up throughout the film, right up to the very last line, the admission that Sam asked the man who purchased his paintings for a double bed! Performance: For this movie to be a success, the performances had to be just right. First of all because of the tone of the film, a dark comedy with a subtle sense of humor. Secondly because it is an ensemble piece with a very small cast. There are only nine speaking roles in the film. And every performance is just right. Edmund Gwenn is charming and lovable as Captain Wiles. The great character actress Mildred Natwick was the perfect choice to play the spinsterish Miss Gravely. 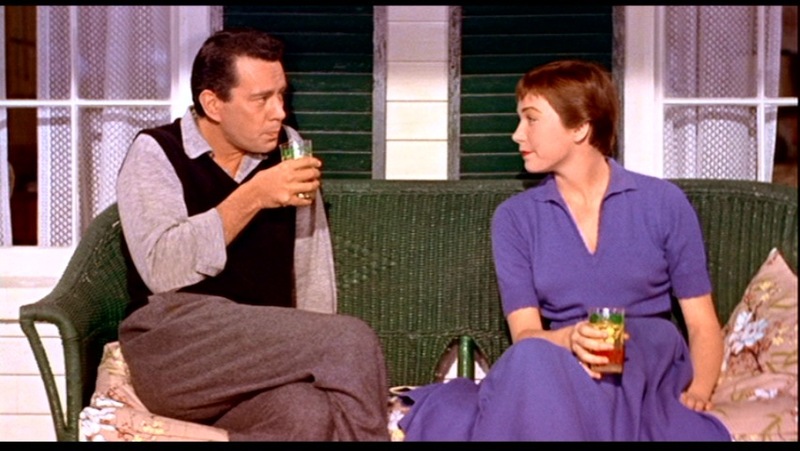 Shirley MacLaine in her film debut shows the charm that she would elicit to even greater effect in later films like The Apartment. 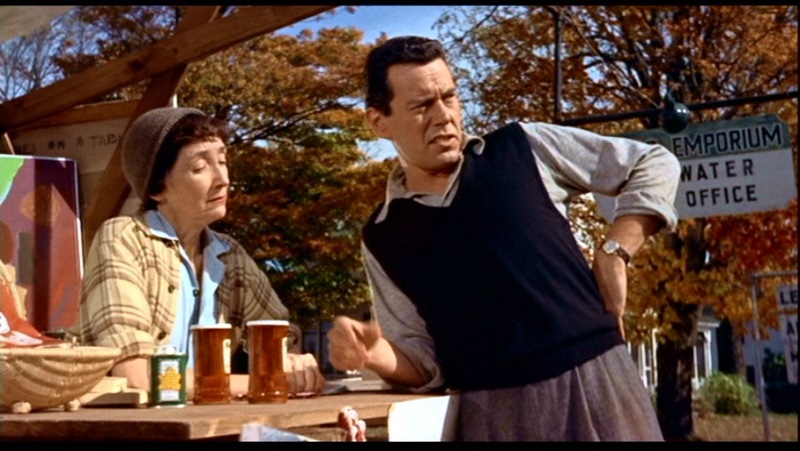 And John Forsythe pulls off the most challenging role in the film, by making his character a bit of a cynic, who isn’t above the occasional snark in another person’s direction, but always remains likable. That could be said of all the characters, really. They have a streak of New England eccentricity, but all remain endearing. This is almost word-for-word how the scene plays out in the movie as well, just one example of many in the book. 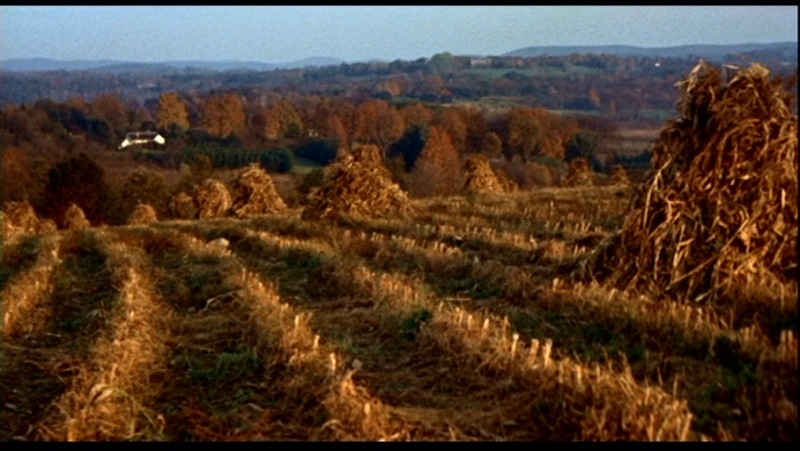 The Trouble With Harry was to be filmed in the East of the United States, at the time when the trees were in full autumnal color. It’s the first time, to my knowledge, that a film has been made in color specifically in the season for which the action occurs. So I brought together actors, cameramen, a whole crew and we left for Vermont. 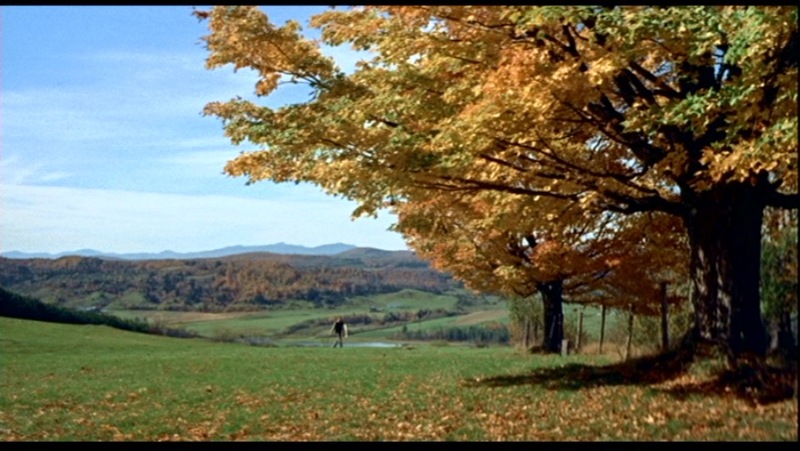 There we waited for the leaves to deign to transition from green to yellow and from yellow to red…It’s very interesting because during the entire film the color scheme will be that of the trees: yellow and red. 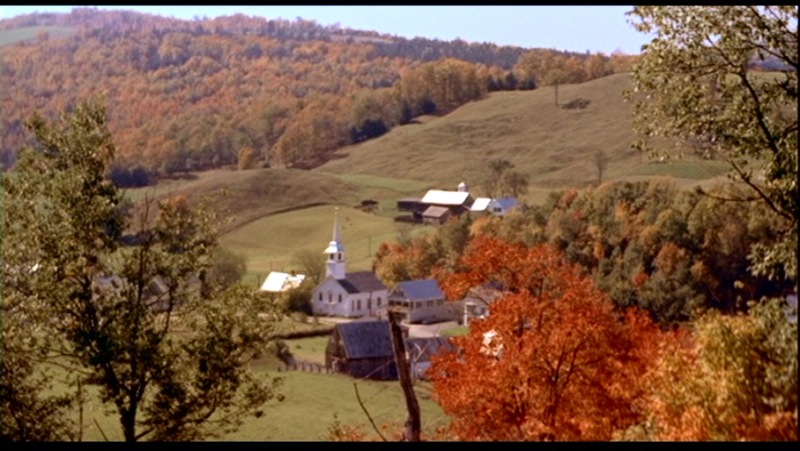 Initially Hitchcock hoped to film the entire movie on location in Vermont. Unfortunately the weather did not cooperate, so after filming about a third of the movie on location, the remaining work was done back on the Paramount lot in Hollywood. Although the action unfolds in the course of a single day, the film begins green and ends red. It was essentially a counterpoint. This green and red color scheme extended beyond the foliage; you can see the dominant green in the above image, as Sam and Jennifer get to know each other. The autumn colors are magnificent, and you may have noticed that I never show the corpse in a way that could be disagreeable. Rather than show the face, I show the drawing that represents it. To my way of thinking, the characters in The Trouble With Harry have reactions which are absolutely normal and logical. It’s their peculiar behavior, free from affectation, from dissimulation, from worldly concerns, from conformity, that makes us believe they cannot be real. In other words, instead of the logic of the absurd, I prefer the absurdity of logic. Mr. Hitchcock, meet Mr. Herrmann: Legend has it that while Alfred Hitchcock was completing To Catch A Thief, he asked that film’s composer, Lyn Murray, if he could recommend someone to score his next movie. Murray immediately suggested his friend Bernard Herrmann. And so began one of the greatest partnerships between director and composer in the history of cinema. Herrmann’s scores for Psycho and Vertigo are his most remembered for Hitchcock, and his most discussed. But his first score for Hitchcock, The Trouble With Harry, is absolutely charming, and perfectly suited to the material. Late in his life, Hitchcock said this was his personal favorite of all the Bernard Herrmann scores for his films. Recurring players: Edmund Gwenn, a Hitchcock favorite from his time in England, had already appeared in The Skin Game, Waltzes From Vienna, and Foreign Correspondent, in which he had a juicy cameo as Rowley the assassin. 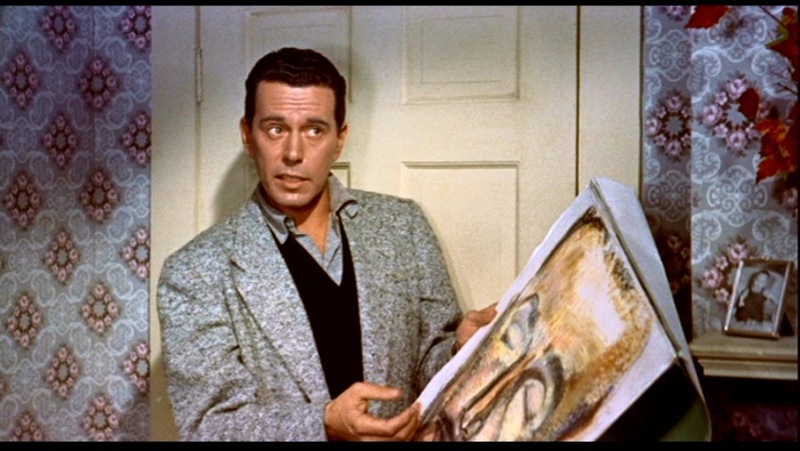 And John Forsythe would appear in Topaz fourteen years later. Where’s Hitch? Hitchcock’s cameo comes at around the 21-minute mark. 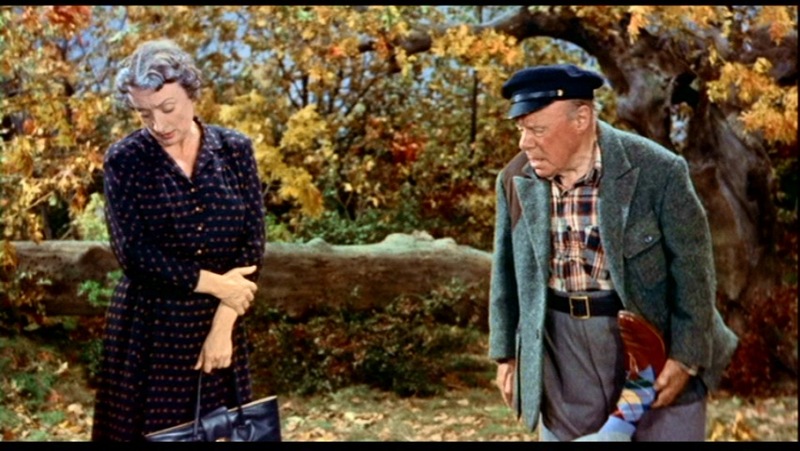 When Wiggy looks out the window of her general store and sees the old man looking at the painting, Hitchcock can be seen walking along the road from right to left. I chose that novel and was given a free hand with it…I didn’t change it very much. To my taste, the humor is quite rich. One of the best lines is when old Edmund Gwenn is dragging the body along for the first time and a woman comes up to him on the hill and says, “What seems to be the trouble, Captain?” To me that’s terribly funny; that’s the spirit of the whole story. I’ve always been interested in establishing a contrast, in going against the traditional and in breaking away from cliches. With Harry I took melodrama out of the pitch-black night and brought it out in the sunshine. It’s as if I had set up a murder alongside a rustling brook and spilled a drop of blood in the clear water. These contrasts establish a counterpoint; they elevate the commonplace in life to a higher level. Definitive edition: The Universal blu-ray released in 2013 features excellent sound and picture. The Vista Vision format translates very well in HD, and the movie looks lovely. 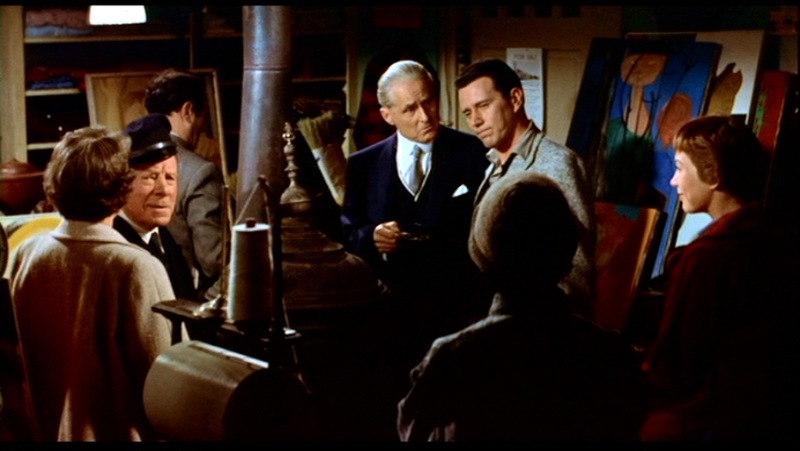 Also included are a documentary clocking in at a little over half an hour, which includes interview footage with actor John Forsythe, associate producer Herbert Coleman and screenwriter John Michael Hayes; and production photographs. The trailer included is not the original theatrical trailer, but rather a VHS release trailer from the late 1980’s. I’m not sure why the original trailer was not included, as it can be found online in widescreen format with a little searching. This is a Hitchcock film that I haven’t really heard of. Thanks for this write up, now I’ll have to watch it, I suppose! Thank you for your nice comment! This is not a typical Hitchcock film but I’ve always had a soft spot for this one. I’ll definitely add it to my IMDB watch list.